Group, Mr. Francis Vincent Berdan, and head of Product Sales and Support Division, Mr. Guilberto Benedicto. 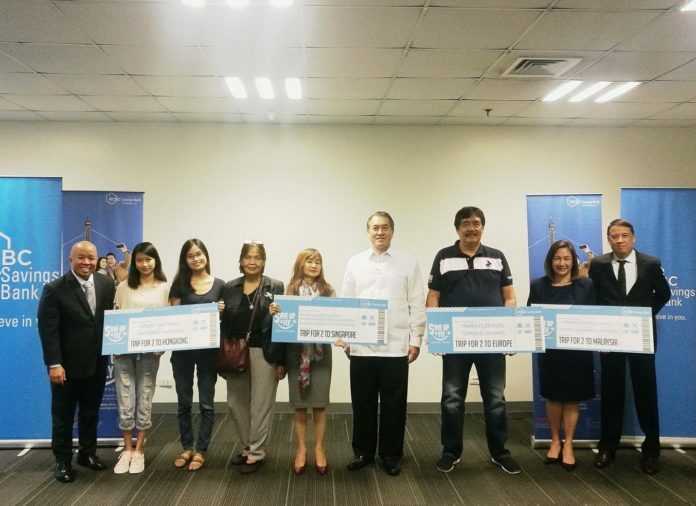 Launched in 2017, the Save Up and Fly Promo earns an RSB depositor a raffle entry for at least P5,000-worth of new or additional deposit, depending on the RSB savings and checking account that was opened. Aside from getting a raffle entry, clients can instantly win a brand new Samsung Phone by opening a new Dragon Savings and Dragon All-in-One Checking account and maintain at least Php 250,000 deposit for 10 months. RCBC Savings Bank (RSB) is the consumer banking arm of Rizal Commercial Banking Corporation (RCBC) and a member of the Yuchengco Group of Companies (YGC). It is one of the top thrift banks in the country, with over 150 business and lending centers nationwide. Retail financial services include deposit and investment products, as well as auto and housing loans. For more information on RCBC Savings Bank, visit www.rcbcsavingsbank.com.